One of our clients is trying to connect to a ODBC Connection. When they hit the "connect" button. Omniscope closes and gives an error. Error messages just sent to Visokio. They are using 2.8 b1216. Alex - Please check that the data source, the ODBC driver and the Omniscope installation are all aligned, either all 64-bit or all 32-bit? What repository/database are they trying to connect to? Access? OK we will check the error reports...why are they using ODBC drivers, when JDBC drivers would be much better? Also switching to 64-bit would be much better? Can you use the SQL Server driver instead? Because the SQL direct connection didn't work, they are trying other solutions. 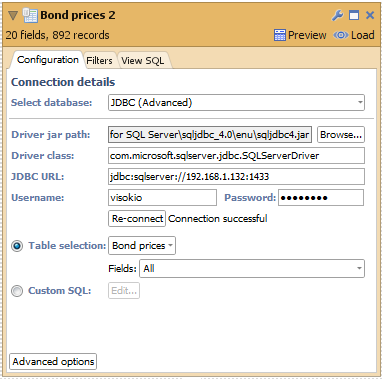 There is some knowledge about ODBC and none about JDBC, therefore they went for the ODBC option. It is a bit strange, as we (OPC) can connect to their database with a SQL connection. And they are not able to connect to this same database. I hope the error report will help you to solve this? Nevertheless, the ideal situation would be to get the SQL connection working. Thanks by the way for the incredible rapid responses!! Can you update me on the error reports? The error is at the ODBC driver level which is crashing the java virtual machine. We have some diagnostics from Omniscope itself but not enough to be conclusive. Can you confirm the architecture (64 bit/32 bit) and whether you are using the Microsoft SQL Server 2008 or jTDS driver for the successful connection ? The error report that we have is occurring on a 32 bit OS, can you confirm the size of the dataset that you are working with just to rule out memory limitations ? We would also like to try connecting the 32 bit OS version using the JDBC driver in advanced mode (this device driver is the one used when you select the "Microsoft SQL Server 2008" driver. We can help with the correct syntax during a screen sharing session or you can email us the connections details that you use in the SQL Server connection and we can create the url for it. Copy the "Microsoft JDBC Driver 4.0 for SQL Server" ddirectory into your Program Files directory. Did you find a solution for the problem with the proxy settings that prevented us to configure the SQL connection? We are still working on a fix for the proxy settings interfering with the connection to the SQL Server. I will post an update as soon as we have something that you can try.